New Haven: If you think you have nothing to do tomorrow night, think again. You most certainly do! Grab a friend or a date and enjoy a concert performed by the New Haven Symphony Orchestra entitled "The Princess and the Firebird". "The Princess and the Firebird" takes place Saturday, November 23rd from 7:30-9:30pm, and the performance is conducted by award-winning William Boughton. Tickets range from $15 - $69 and may be purchased online. 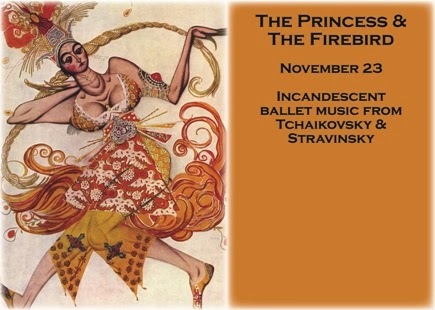 An evening of incandescent ballet music from Russia and France brings Stravinksy’s Firebird, Delibes’s dancing doll, and Tchaikovsky’s Sleeping Beauty to life. Downtown New Haven is known for its lively restaurant and nightlife scene on Saturday night, but if you're looking for another outlet, I encourage you to check out this performance from the New Haven Symphony Orchestra -- the 4th oldest orchestra in the United States!